What is the best way to celebrate Omara’s 85th anniversary and 70 years of performing professionally? A musical party with Diego el Cigalathroughout Europe’s greatest concert halls. The great Cuban diva and artistic ambassador of her country wants to celebrate with a grand fiesta which represents the impressive sweep of her career – on every stop meeting with old friends and new to perform together much loved Cuban classics . The tour will reflect different aspects of her long career, taking it way back to her younger years and her continuing love of elegant cabaret, from the Buena Vista days right up to the present with different tastes and flavours, of what will be a musical feast, full of piquant sabrosura. Joined by the amazing gifted Spanish flamenco vocalist Diego El Cigala the artists will perform timeless Cuban classics as well as songs from their own repertoire. Passionate and deep, el Cigala is one of those few artists who has remained true to its musical heritage and simultaneously achieved a worldwide recognition by audiences world-wide. Omara met Diego for the first time on stage at the Hollywood Bowl last summer. The intensity of the encounter was so overwhelming that they knew instantly they would collaborate further. 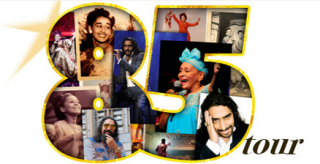 So through their deep traditions and stunning musical personalities 2016 will bring us the 85 Tour.